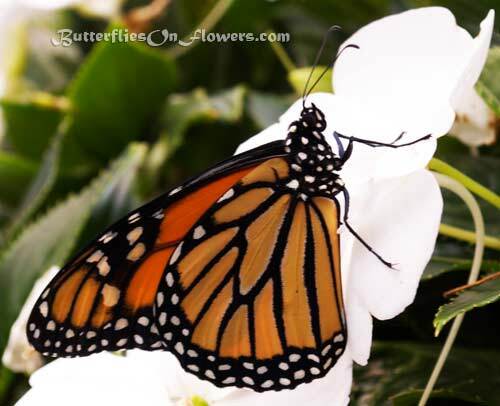 Caption: A Monarch Butterfly (Danaus Plexippus) sits close-winged on white flowers. I like this photo because of the contrast between monarch and flowers. This nature photo is taken on a hanging plant in our back yard. I put many of the monarchs there to dry their wings so they're out of reach from Ms. Lina...our canine backyard nature terrorist. She seems to prefer Peter Cottontail to the butterflies though. Butterfly facts: Monarchs are located in the following regions of the world: United States, southern Canada, Carribean islands, Australia, and New Zealand...and ,of course, remote parts of Mexico during their winter migration.